Pan Roasted Vegetables are lightly sautéed in butter and olive oil until caramelized and sweet. Adding tomatoes at the end makes a delicate light sauce. An easy lightened up side dish that only takes 15 minutes to make! 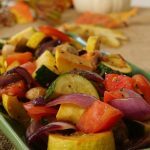 Pan Roasted Vegetables are perfect for the holidays and delicious for an easy weekday side dish! The holidays are fast approaching and before they are completely upon us, I wanted to share with you one of my most loved, easiest side dish that I know you are going to love also – Pan Roasted Vegetables. When it comes to the holidays for us, the Turkey is the star of the show and also takes up all the oven space! Side dishes not made in the oven are important. I’m thinking you have that same problem, right? Made on the stove top, this side dish is easy to make! When we were kids Mom used to fry zucchini all the time and I’ve always loved it pan fried. Here, I’ve updated her recipe by adding more delicious vegetables. 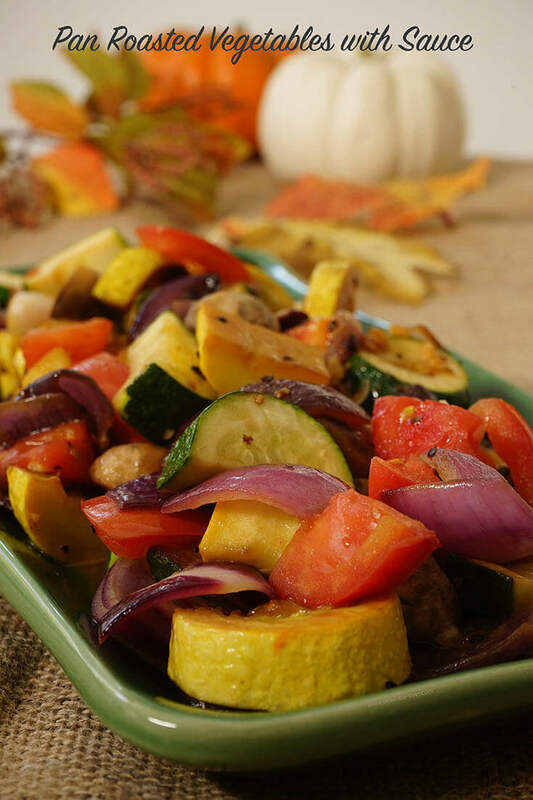 Pan roasting the vegetables adds even more flavor to an easy side dish! What’s even better about this recipe is you toss everything into the skillet and only stir them three times during the cooking process. What? Yup, only three times because that’s how you get beautiful caramelization. 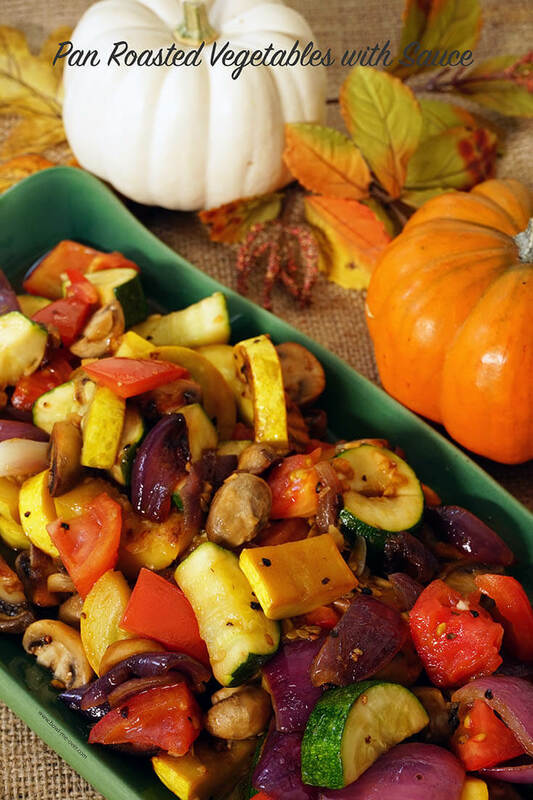 Here’s how easy this side dish is – clean and slice the squash, onions, slice the mushrooms in half. Dice the tomato and mince the garlic. Heat a heavy skillet over medium on the stove. When the skillet is hot then add butter and olive oil. Stir and set the timer for five more minutes. Don’t stir or move the vegetables around. One chicken THREE meals with step-by-step directions and a FREE mini-cookbook!! GET MINE NOW! After five minutes stir again, set timer for an another five minutes. When there is one minute left on the timer, add the tomatoes and garlic and mix well. The garlic will cook in less than a minute, the tomatoes will reduce from the heat and make a light pan sauce. Season with salt at the end. If you season during the cooking process, the moisture from the vegetables will make them steam, not caramelize. Don’t fuss or stir the vegetables. Just let them sit and caramelize. See that beautiful caramelization? That’s what happens when you allow the vegetables to sear. A heavy bottom skillet – this is a great time to use a cast iron skillet or other heavy pan. That heavy skillet will evenly distribute the heat and sear beautifully! I know you’ll love this one – here’s the recipe! Love your veggies? Here are even more delicious side dishes to try! Fresh crisp vegetables lightly sautéed in butter and olive oil until caramelized and sweet. Adding tomatoes at the end makes a delicate light sauce. An easy lightened up side dish that only takes 15 minutes to make! 1 clove garlic large clove, if your cloves are small use two. Clean and slice the squash, onions, slice the mushrooms in half. Dice the tomato and mince the garlic. Heat a heavy skillet over medium on the stove. When the skillet is hot the add butter and olive oil. When the butter and olive oil is hot and bubbly, add the squash, onions and mushrooms, season with black pepper and red pepper flakes. Mix to combine the spices - spread the vegetables evenly in the pan, then set your timer for five minutes. Do. Not. Stir. When the timer goes off, stir and set the timer for an additional five minutes. After five minutes stir again, set timer for an another five minutes. When there is one minute left on the timer, add the tomatoes, garlic and salt. Mix well. The garlic will cook in less than a minute, the tomatoes will reduce from the heat and make a light pan sauce. Need a delicious side dish NOT cooked in the oven? 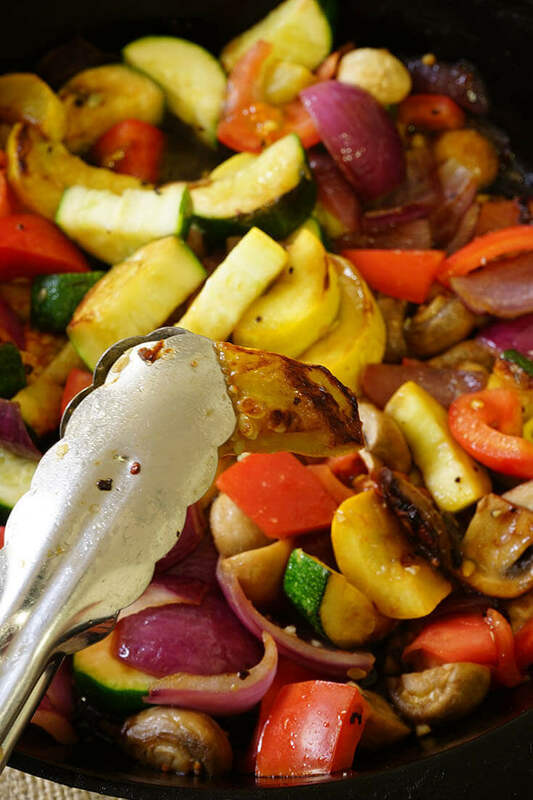 Pan Roasted Vegetables are lightly sautéed in butter and olive oil until caramelized and sweet. Adding tomatoes at the end makes a delicate light sauce! I am a big veggie fan and roasted veggies are my favorite! But I usually don’ seem to make it right (and so I’ve been doomed to buy them at the stores – not the best thing with all the oil and the high prices – but I felt like I had no choice!) But now I think that I can totally make them at home! Thanks to this great recipe and its clear and helpful instructions!! Thanks, Debra! Thanks so much Liza. Roasting them yourself is so easy. It adds a ton of delicious flavor and sweetness. You might even get the boys to eat their veggies now! 😉 Thank you so much for stopping by! These roasted veggies are perfect for our Thanksgiving table. I agree it is nice to have a recipe that doesn’t have to cook in the oven. Oven space is so scarce around the holidays, why not roast them right on the stove top. It’s so easy too – you’ll love these Sandi! All of those roasted veggies make me very happy! That’s my favorite way to enjoy them and I’ll be trying your recipe! Wonderful! 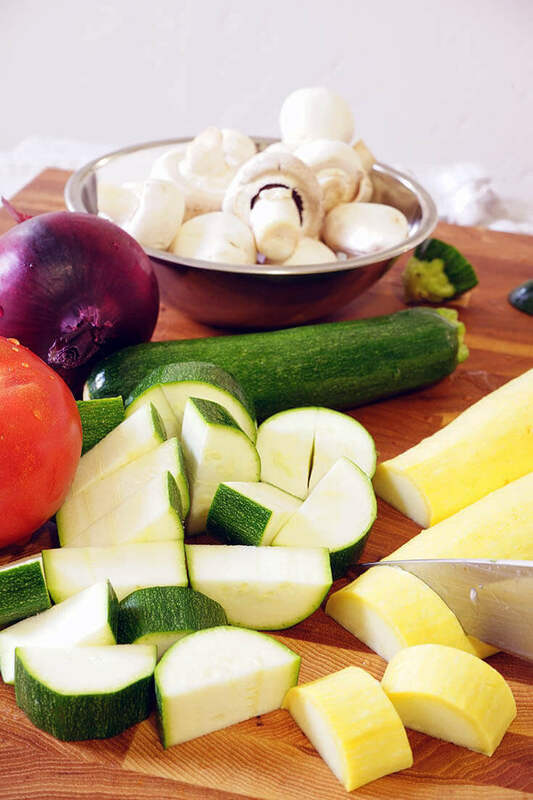 Enjoy Julie – such a fabulous way to enjoy veggies!!! Oh yes! Roasted vegetables are the best! I agree, so delicious but easy too! Thank you!!! Thank you so much, I appreciate you stopping by Jocelyn!!! I think we shall! Can’t wait unti you guys get here Mom – will make a pile of these veggies! Would these last in the fridge for a few days? Absolutely! You can keep these in the fridge up to 3 days. I would reheat them on the stove.